Are there direct flights to North Cyprus? At the moment, all flights to North Cyprus have to stop in Turkey for approximately 45 minutes. You can also fly directly to South Cyprus, Larnaca or Paphos Airports, and cross the border to the North side. How long are we allowed to stay on the island legally? You are issued up to 3 month tourist visa when you arrive, after which you must apply for a resident’s permit. I believe that Northern Cyprus Property Estate Agents must now be registered by the TRNC Government. Is Royal Estates a Registered Estate Agent in Northern Cyprus? Yes, we are a fully registered and licensed estate agency, and also a member of TRNC Estate Agency Union. We pride ourselves for our honesty and integrity. Therefore Royal Estates must be your first and only choice for security and peace of mind! I don’t really know the areas very well, how will I know that I am choosing an area/location that I want? Our experienced and knowledgeable staff will provide you with all the support that you need to identify your ideal location and property. Who will do all the paperwork for our ‘Permission to Purchase’? We are able to deal with all the paperwork and application for your ‘Permission to Purchase’ for a much lower fee then solicitors. Can the landowner encumber and/or borrow against the property once contracts have been signed? According to the new estate agency law, as soon as the sales contract is signed, and its stamp duty paid, you, or your estate agent or solicitor, can register your contract at the District Lands Office. This ensures that the Title Deed owner cannot borrow against, or sell the property, to a third party without your written permission. What are the approximate costs when we rent a 2/3 bedroom furnished house? Long-term (1 year) rentals start from £350 Stg per month. You would also pay for electricity, water, gas and telephone. How do I purchase a property in North Cyprus? Please check the property buying procedure in North Cyprus. Can I get a mortgage in the TRNC at present? The banks in TRNC do not offer any loans or mortgages to any foreigners, but there are some developers who offer long-term payment terms on their properties. Re-sales properties tend to be cash purchases. What documents are required when purchasing a property? Just your passport is required to purchase a property. Also, in order for you to be granted the Title Deed to your property, you need to provide certification from your local police station attesting to your good character. This must be a present dated document .It is not necessary to bring this document with you on your initial visit, it can be forwarded later. Can I pay for the property from home? Yes, this can easily be done from any International bank directly into our İş Bank GBP Account. Do we need to open a bank account in North Cyprus? What are the costs of shipping and do you have a list of agents? Shipping costs are based on the cubic meter – we have a list of agencies that we can forward to you. If I buy a plot of land, do you have plans/designs etc? Yes, we have a variety of plans available at the office and can take you to a reputable architect to browse through 3D plans, designs, etc. Please see our Plan & Build Your Villa section for more information. Can we pay our bills by standing order? Yes, you can pay electricity and phone bills by standing order. You can pay for your water in advance in the local Council. Do I have to make a new Will in North Cyprus? Once the property is registered in your name, we strongly advise you to make a new Will. Our lawyers can draw up a new Will for you. Am ? required to take out medical insurance? This is not mandatory, and we find that most expatriates rely on the local medical care, which is good and extremely reasonable. Are there tax implications if I decide to sell up and return to the UK/Europe etc? At present, your first sale is tax free, so there are no taxes to pay and no restrictions on the repatriation of funds. Who looks after my property whilst I am away? Royal Estates’ Property Management team can take care of your property, i.e. paying of bills, security and general maintenance (subject to your approval) for a small monthly fee. Who will advertise my property and obtain bookings if I wish to rent it out? We will advertise your property and rent it to suit your time frame and requirements. We can also collect and deposit the rent into your account while you are away. Please Contact Us for more information, or visit our services section to see our lettings and property management services for landlords. At present, you are only allowed to own one property at a time .But if you establish a ltd. Company locally your company can buy unlimited properties. I would like to buy property as close to a Golf Course as possible. What areas would you suggest I should look for? Catalkoy, Arapkoy, Esentepe, Karaagac, Bahceli and Tatlisu have become extremely popular areas for buyers wishing to invest in villas and apartments close to the Korineum Golf Course. If I were to buy land, where would I go to have my villa designed and built for me? Royal Estates has a good relationship with reputable builders, who will design and build according to your requirements. Please refer to our Plan & Build Your Villa section, or Contact Us for more details. Can I bring my personal belongings from overseas? Yes, we can introduce you to a number of different freight companies who specialise in shipping goods, or household lots, to North Cyprus. Contact our office for more information and advice. How do I become a resident of North Cyprus? Becoming a resident in North Cyprus is a very simple process. Certain documentation is required to be stamped by the relevant Authorities, which will enable you to stay on the island, for as long as you wish. We are happy to introduce you to our associates, who will guide you smoothly through this process. Can I bring my pet/s to Northern Cyprus? Pets are welcomed in Northern Cyprus, as long as all the relevant documentation from a UK Vet is completed prior to your pets’ arrival. Quarantine period is approximately 28 days. Can I use my UK Driving licence? For 3 months you can drive with your UK licence, after that you can only drive with a TRNC licence. Once you have been issued with your residency permit, a local licence can be administered within a few days. The Escape Beach, in Alsancak, is one of the safest beaches, which is close to Kyrenia. There are many hotels with private bays that permit non-residents to use them for a small fee. What extra charges are there when we buy a property, or land? There are utility connection fees and electricity transformer charges for many new builds (usually shared between all the buyers on the development). All new property purchases are subject to 0.5% Stamp duty, 3% Title transfer tax, and 5% VAT. Please see our Taxes section for more information. How much will I need to pay as a reservation deposit on a Northern Cyprus Property? Before arriving in Northern Cyprus make sure you have access to sufficient funds to cover the reservation deposit on a property. The minimum required reservation fee in Northern Cyprus is normally £1000 Stg, which can be paid by cash, credit card or bank transfer. Most reservation deposits to sellers are non-refundable, so it’s important to be sure of your financing before reserving a TRNC property.
? am not a citizen of Northern Cyprus, but I want to purchase two properties. How can I do this? You can sign the contract of sale for the two properties in your own name, but the ‘Permission to Purchase’ will only be granted for one property. The second property will have to be registered in a nominees’ name, i.e. partner, friend or relative that you know will hold the property in trust for you. Alternatively, you will need to set up a TRNC company. Or you can register your second or third properties with a Trusty Company , which we recommend to you , with a small yearly fee. Are there any limitations on buying land in Northern Cyprus for foreigners? Yes, there is a limitation. The land in North Cyprus is measured in donums. Foreigners cannot buy more than 1 donum of land (which is 1,338 square metres or approximately 14,400 square feet) for one property. This area of land satisfies the majority of our clients. In the case where you want a larger area of land, this can be easily met by adding members of your family as co-owners, or by forming a local company to buy the land in its name. When buying properties in North Cyprus and applying for ‘Permission to Purchase’ do ? need a Police Report? Where should ? apply? Yes, it is necessary for foreign nationals, when buying property in North Cyprus, to apply for and obtain a Police clearance report from their local police station in their country of residence. You will need to include this report in your ‘Permission to Purchase’ application. As your estate agent, we can prepare your application package, but you must bring us the above mentioned police report. The Police Report can take a few weeks to organize, and we suggest you to obtain this before your arrival in North Cyprus. What TRNC taxes are payable on the purchase and when are these payable? Taxes are usually payable right at the end of the transaction, after your ‘Permission to Purchase’ permit has been granted, and the Title Deed is being transferred to your name. The tax rates applicable are as follows: Land Registry Transfer Fee - 6%: However, every person has a ‘once in a lifetime’ exemption to reduce this tax to 3%. If you decide to use this right, you will pay only 3%. VAT - 5%: This is only payable if the seller is classed as a professional (Any construction company or developer is classified as a professional). If you are buying from a non-professional, private seller, there is no VAT on a resale property. Stamp Duty: Payable at 0.5% of the contract price, if paid within 21 days from the date of contract. If it is not paid within this time frame, the rate increases to 1.5% of the contract price. What types of deeds are available? There are mainly three types of deeds for Freehold property, which differ significantly, but all of them are absolutely legal. Please see our Title Deeds types section for more information. How long does it normally take to complete the paperwork to purchase a property in North Cyprus? It is a very straightforward and easy procedure. After you choose your property, it usually takes, at least, one day to complete all the paper work and signing of the contract. How long will the ‘Permission to Purchase’ process take, and what does it involve? It could take up to 6 months to be granted ‘Permission to Purchase’, so the seller can transfer the Title Deed to your name. Searches will be made by the Immigration Department, Land Registry and Military. All being well, permission will be granted. If you want you are free to sell the property during this period of time. Do I need to wait for my ‘Permission to Purchase’ before I can move into my property? No. Once contracts have been exchanged and all monies paid, you will be able to take possession of your property and move in or rent it . What are the terms of payment for buying a property in North Cyprus? The terms of payment depend upon the type of property you buy. On the exchange of the contracts, Re-sale property is usually paid in full. However, a reservation payment to your estate agent or solicitor is advisable, which takes the property off the market until the contracts are exchanged, and, if applicable, the Title Deeds are checked. The payment terms for a newly built, or built-to-order, vary depending upon the construction firm. It could be from 100% upfront, to 10-30% deposit, with monthly instalments, or stage payments, until completion. Please indicate your financial position and your preferences regarding how you would prefer to settle your purchase. As we are not tied to one specific contractor, we would be able to find the ideal property to suit your financial status. Are there any limitations to repatriate rental or any other income from North Cyprus? There is no limitation on repatriating the profits, including the rental income from your property in North Cyprus. No questions are asked about the source of income. But usually 10% of any rent income is paid to the Tax Office monthly. What is the banking system like? Is it possible to open a bank account in North Cyprus in £ Stg? There are many local, private banks in North Cyprus, as well as branches of Turkish banks. You can open a savings or current account, which offers good interest rates. These can be in any currency you choose, i.e. TL, GBP, Euro, USD etc. What are the major cities, and what do they offer from the point of view of buying a property in North Cyprus? Lefkosa (Nicosia) – is the capital of the Northern part of the island with the population of 150,000. It is divided into Turkish and Greek sectors by a boundary known as the `Green Line', which runs through the city. With its history, architecture and places of interest, this city is fascinating. Such a place might attract buyers planning to work for Local Government, or an International company. If and when the island reunites, investment in property here might be very rewarding. There is a massive potential for investment growth. Gazi Magosa (Famagusta) – This city resembles an outdoor museum. There is so much historical interest concentrated within the many museums. To name a few, Saint Barnabas Monastery and Museum, Agios Ionnis Greek Orthodox Church and Icon Museum. This, including the University, is the cultural centre of the island. 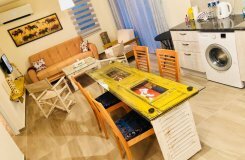 This area would appeal to families with children of different ages, just as Kyrenia does. However, the landscape of this area is very different. It is flatter, and the sea view is rather more restricted, but the golden sand beaches are the best on the whole island! This area is becoming increasingly popular amongst foreign buyers – not just the British. At present, the British Community here is smaller than that of Kyrenia. This keeps the property prices lower and more attractive to other European buyers. Girne (Kyrenia) –The most popular property destination, is famous for its historic Old Harbour, Castles, museums, resorts, beautiful seaside, plenty restaurants, bars, casinos, etc. The large British community is spread from the town itself to all its vicinities. The head office of the British Residents Society is located here. This fascinating town is situated on the northern coast of Cyprus with backdrop of the Besparmak (or Five Finger) Mountains. Most of the properties in this area have both sea and mountain views. Also, the newly completed Championship golf course and proposed marina project attracts many people from all around the world. Guzelyurt (Morfou) & Lefka – is famous for its olive and orange orchards. It is located about 30 miles to the west of Kyrenia (Girne). This area is famous for its delicious , oranges ,mandarins , apples, vegetables, grapefruit and melons which are abundant, due to the underwater springs. Guzelyurt is also famous for its annual Orange Festival, which is a major event lasting two weeks. The golf club (9 holes) is located outside the town. It is open every day to the public. Golf clubs are available for hire at the clubhouse, and the best days to meet and play with the friendly local members are Tuesdays and Thursdays. However, do not expect to see a sophisticated golf course by European standards. It is basic, but the views are fantastic. Imagine finishing the game just before the sun dips over the horizon across the blue, shimmering sea. What is the official language in the North Cyprus? The official language is Turkish; however English is a business language and widely spoken. What is the time difference with the UK? Cyprus is two hours ahead of the UK GMT time ( now 3 hours) . Is North Cyprus recognised elsewhere in the world? The TRNC has an Embassy in Ankara and Consulates in Mersin and Istanbul; Offices of Representatives in London, Washington, New York, Brussels, Pakistan and Abu Dhabi's Honorary Representatives in Italy, Germany, Austria, Canada, South Africa and Finland. There is a Turkish Embassy, British High Commissioner and German Consulate in the TRNC. What would you say are the advantages of investing in a North Cyprus Property? There are so many reasons why Investment in North Cyprus Property makes good, economic sense. We will list a few for you, but for more information please go to our Investor’s Guide section. Here are just a few of those good reasons to buy and invest in property in North Cyprus – 300 days of sunshine – very low crime rate – good potential for long term and holiday property rentals – low cost of living – good value property prices – steadily rising property values – world class golf course – stunning beaches – friendly local people. I would like to view selection of your Northern Cyprus Property during my stay in North Cyprus: Can this be arranged for me? Yes, it can. Please just let us know where and what time you want to meet with us. We can collect you from your hotel and take you around to show you our properties. Can we use our own UK solicitor? No. You must use a solicitor based here in Northern Cyprus. You can use a solicitor of your choice, however, we do have qualified solicitors we would be happy to introduce you to. Is their an International School for my children to attend? Yes. There are private schools and colleges that offer English education in full, following the UK curriculum for children of all ages. Who will take pictures of my villa while it is being constructed? After you have agreed to purchase your property, you will not be left on your own. Our After Sales Team will photograph your house during construction stages which will be forwarded to you . How do we know when our payments are due and how do we make payments to the builder/seller? The builder will notify us, in writing, when a stage of construction has been reached. In turn we will inform you, together with details, of how you can transfer funds to the development company. I am interested in renovating an old property, can you help? As well as having a number of traditional Northern Cyprus ‘village style’ properties in our portfolio, Royal Estates can also recommend very good builders who specialise in such renovation work – but, please bear in mind, that most of these older North Cyprus properties will need a complete overhaul to bring them up to European standards. Are there tax implications in Northern Cyprus if I decide to sell up and return to my country of origin? At present, your first sale is tax-free so there are no taxes to pay, and no restrictions on repatriation of funds. Please contact us if you have any questions about any other topics we have omitted to mention.